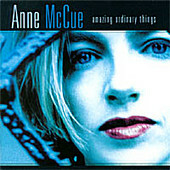 Los Angeles-by-way-of-Australia singer-songwriter Anne McCue delivers, on her sophomore release, a gorgeous, folk-rooted pop record that showcases the depths of her magnificent voice, sincere approach to lyrics, and ample - not too flushed and not too dry - approach to fleshing out her songs. Based around her voice and acoustic guitar, a sturdy pop-rock band backs her up, giving the songs a nice adult-contemporary push. Though never bland or stale, her voice soars above all, giving the songs an identity and a memorable face. Here are thirteen pop-rock numbers that are full of emotional and wisdom, something Anne McCue makes sure she retains no matter how tight and glossy the production. I'll give this a B-.